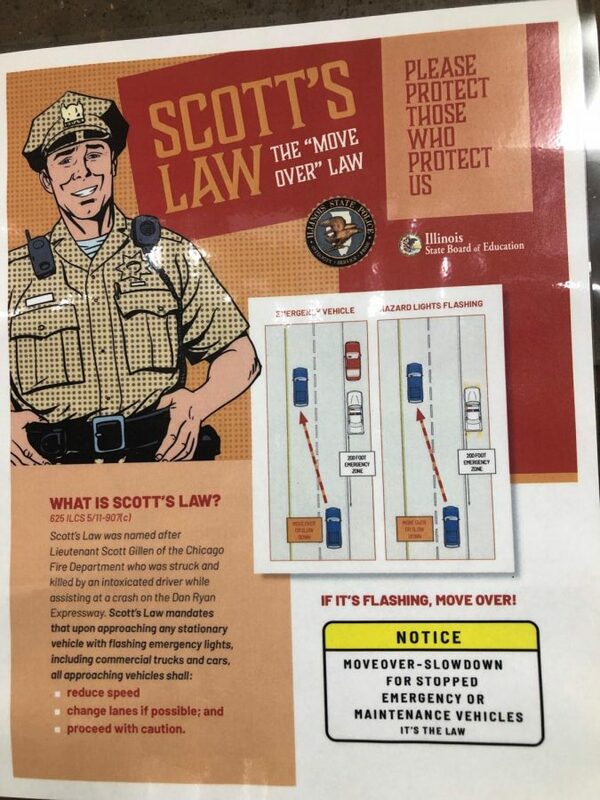 Scott’s Law, also known as the Move Over Law, was named after Lieutenant Scott Gillen of the Chicago Fire Department who was struck and killed by an intoxicated driver while assisting at a crash on the Dan Ryan Expressway. Recently, there has been an increase in awareness also due to a movement called the “Move Over Project”. This was started by a daughter of a state trooper, Lucy Kuelper, who posted a picture of her holding a sign saying “move over…for my DAD”. Since being released this project has gone viral and brought a great amount of awareness to the Law ( https://wrex.com/category/2019/04/01/12-year-old-begins-move-over-project-to-help-bring-awareness-of-scotts-law/ ). So next time you see those flashing lights on your road, be courteous, safe, and move over to save a life.